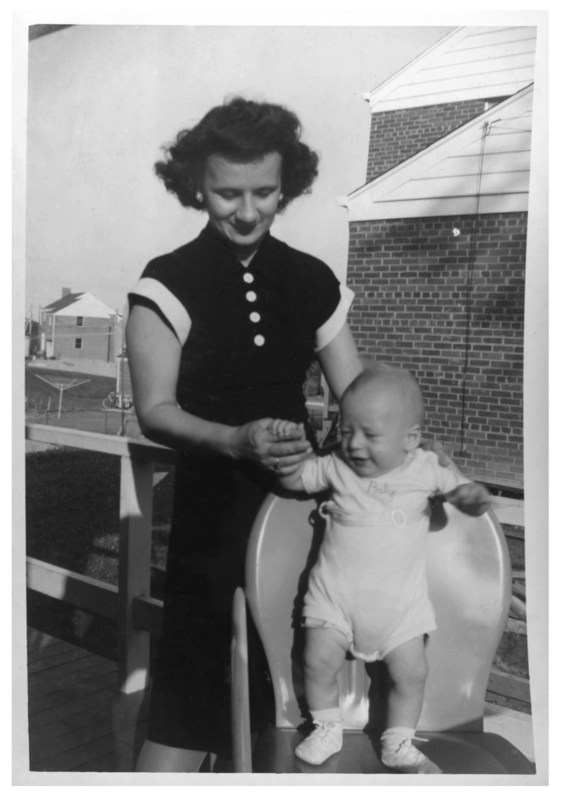 Mom and Me, Silver Spring, Maryland, 1948. Had she lived, my mother would have been ninety-two years old today. She is twenty-seven in this photograph and I was about eight months old. We are on the porch of my grandmother's house on University Boulevard West, where we lived until I was about three. I am the oldest of her four children. My mother was a good, strong-willed woman who wanted the best for her children. She instilled all of us with a drive for success that was not untypical coming from a first generation adult of immigrant parents. And while all of us have been successful in our individual careers and lives, none of us turned out to be quite what she anticipated. Instead of businessmen and lawyers, she got artists, teachers, homemakers, and librarians. And instead of staying put in the Washington, DC, area as she would have wished, all of us chose to live elsewhere. So, as I look at this photograph of my mother helping me stand and take my first tentative steps, I'm reminded of the strong role she played in providing me with the security, self-confidence, and desire that have brought me where I am today. Thanks Mom, and Happy Birthday.